October 17, 2017 October 17, 2017 Dan O.
Oh. The 90’s. When screening calls was a huge thing. It’s the mid-90’s and the Jacobs family is going through a bit of a problem. The mother, Pat (Edie Falco), is having a rough go at work, but is also not really spending much time, paying attention to her husband, Alan (John Turturro). Speaking of which, he’s also a little bored with life and may be having something of an affair. Nothing’s confirmed yet, however, because his youngest daughter, Ali (Abby Quinn), only found out about after seeing a bunch of poems on his floppy-disk. Meanwhile, she’s also worried about what she’s going to do with her life and also with college. Then, there’s her sister, Dana (Jenny Slate), who is having issues with her fiancee (Jay Duplass), but mostly because she doesn’t know if she’s ready to settle down just yet. This leads her to having an affair with an ex (Finn Wittrock), who may or may not be her last chance at some form of freedom and/or happiness. Either way, this family’s going through a lot. Same hair. Same blood. Same sisters. That’s how that works, right? Obvious Child was the sweet, small, soulful, and somewhat beautiful little surprise of 2014. It was 82-minutes of pure heart, comedy, and truth that was rarely seen in movies that were either longer, with more stars, or had a bigger-budget. It ranked on my Top 10 that year, showed me that Jenny Slate was an amazing actress, and oh yeah, put writer/director Gillian Robespierre on my watch. Okay, actually, it’s not all that bad. In terms of sophomore slumps, it’s not that bad, because it shows us that Robespierre still has the knack for writing interesting characters and smart dialogue, but when it comes to the plotting and actual story itself, the movie just has way too much going on, for such a short time, and with no real cohesiveness. It’s as if Robespierre got something of a bigger-budget, had bigger stars, and more time to play around, so she did, but in this case, it actually went against her. And of course, it’s not right to compare this to Obvious Child, because they’re two different movies. But with Landline, you can tell that something’s a bit off this time around about Robespierre and what she’s doing. With the talented ensemble, she’s very lucky, as everyone here isn’t just great, but funny and brings a lot to the table. They all feel like a very lived-in family, who not only have gotten used to each other for so long that they don’t even care to put up resistance any longer, but that they also know each other so freakin’ well, it’s almost painful. That’s how real families are, regardless of how close-knit they are and it’s one of the aspects that Landline nails down well. The only issue is that every so often, the movie will jump from one subplot, to another, and depending on how interesting one is, the movie works, or doesn’t. Landline suffers from a lot going on, with very little time, and not nearly as much concentration as they should have all deserved. You can tell that Robespierre is trying and relatively succeeding, but I don’t know, something’s just missing. What it is, I may never know. I’m not taking Robespierre off my watch, but I will hold her next film with at least a little bit of trepidation. 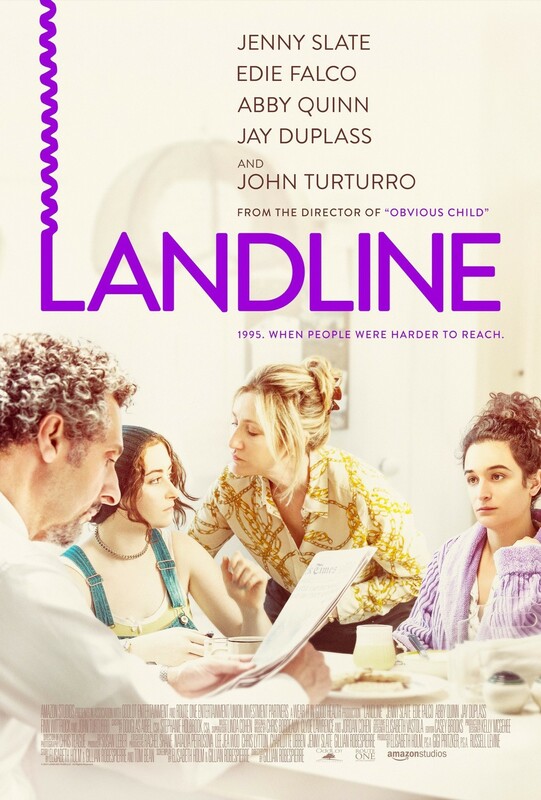 Consensus: Not nearly as focused as it should have been, Landline suffers from having too much going on, with very little time to actually wade through it all, but gets by on a solid cast that’s willing to make this material into something fun and enjoyable. The guys in the family can’t do this kind of stuff. I think anything John Turturro does is golden. Jenny Slate and Abby Quinn really clicked as sisters.